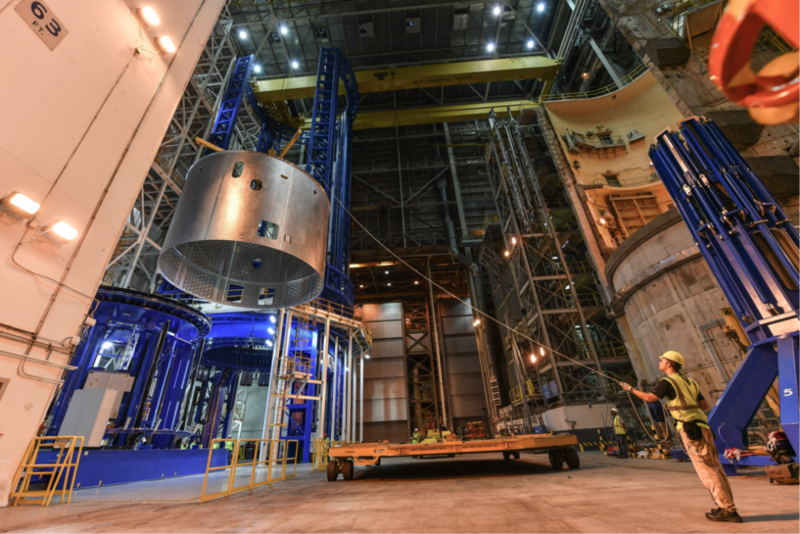 April 18, 2016 – Flight hardware for the core stage of NASA’s Space Launch System (SLS) finished final welding and was moved off the 170-foot-tall Vertical Assembly Center at the agency’s Michoud Assembly Facility in New Orleans. The hardware is for the engine section, and is the first major SLS flight component to finish full welding on the Vertical Assembly Center. The engine section is located at the bottom of the rocket’s core stage and will house the four RS-25 engines for the first flight of SLS with NASA’s Orion spacecraft in 2018. The SLS core stage will stand at more than 200 feet tall and store cryogenic liquid hydrogen and liquid oxygen that will feed the launch vehicle’s RS-25 engines. A qualification version of the engine section, which also has completed welding on the Vertical Assembly Center at Michoud, will be shipped later this year to NASA’s Marshall Space Flight Center in Huntsville, Alabama, to undergo structural loads testing on a 50-foot test structure currently under construction. All welding for the core stage of the SLS Block I configuration — including confidence, qualification and flight hardware — will be completed this summer. Traveling to deep space requires a large vehicle that can carry huge payloads, and SLS will have the payload capacity needed to carry crew and cargo for those exploration missions, including Mars.